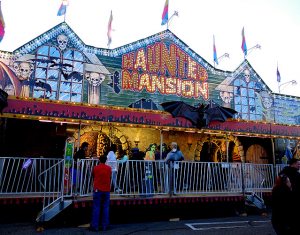 I love the painted facades of the haunted attractions you see at fairs and carnivals. The garish, often airbrushed artwork never fails to catch the eye and promises so much that the stuff inside rarely lives up to your expectations. The more impressive the art, the greater chance you’ll end up like Lio once the ride is over. They’re similar to old VHS and DVD cover art in that way, although thankfully facades haven’t been taken over by Photoshop. But what about when the ride lives up to the facade? That’s a treat and it keeps so many of us handing over our tickets for a chance at another such experience. I have a special treat for fans of that last image. While looking to see if any coffee table books about such facades existed (they don’t), I discovered how Trimper’s Rides by Monica Thrash and Brandon Seidl has the original sketch for that attraction’s facade! This is a truly rare look at designing of such rides and hopefully more will surface as time goes on. These examples also show facades are more than just cool paintings. There’s usually giant monsters, specialized lettering and other extra bits stuck on for good measure. I should also point out how many carnival dark rides are designed to be disassembled, transported and reassembled at another location. This means the length of the ride is effected due to space restrictions, with multiple level rides being more expensive to move. Ride operators might not even have the necessary skills to make repairs if something is damaged on the course of the trip. Permanent attractions, especially ones which don’t rely entirely on mechanical effects, usually don’t have deal with such things and seem to be able to “bounce back” from mishaps faster as a result. Special thanks to Dinosaur Dracula for use of the image!